Sidmouth is located on the south coast of Devon overlooking Lyme Bay. It is approximately 10 miles from Exeter with access off of the A3052. Also within this area are the coastal towns of Seaton and Beer and Branscombe made famous by the recent beaching of the freighter MSC Napoli. Sidmouth is a small, tranquil resort town that nestles between towering red sandstone cliffs. These form the backdrop for magnificent coastal views from and around the town. The seafront area itself is quite small but there is plenty of opportunity for swimming and enjoying the beach. It is an ideal area for a gentle stroll around the gardens or to explore the town or alternatively just choose a deckchair on the seafront and admire the views. For the more active the cliff tops offer good walking and connect to the South West Coast Path. The accent to the east of the town is steep but offers spectacular coastal views. Sailing, paddle boarding and fishing trips are also available in the area. Sidmouth is located on the famous Jurassic Coast - the red sandstone cliffs date from the Triassic era, around 250 million years ago. Sidmouth was at one time a fishing village and port but trade was poor and the fishing fleet moved elsewhere. 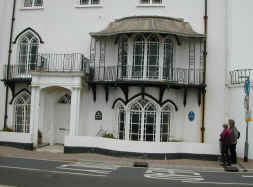 In the early nineteenth century Sidmouth became popular to visit as a seaside resort and attracted many wealthy patrons. It was at this time that many of the fine houses were built along the seafront, many of these are now hotels. The most notable of these is now the Royal Glen Hotel; which has royal connections. Branscombe, Devon is a small village that nestles in a valley that sweeps down to the sea at Branscombe Mouth around 4 miles east of Sidmouth. Branscombe hit the headlines in early 2007 when the MSC Napoli, a 63,000 ton freighter* was beached just offshore of Branscombe beach. 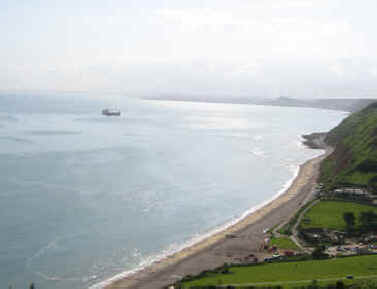 The freighter got into trouble in a storm in the English channel and was beached while being towed to Portland harbour. A great deal of flotsam and jetsam was washed up on the beach in the days following the beaching and crowds flocked there in the hope of finding some valuable booty. We are glad to say that after an initial slow and chaotic start the clean-up has gone well, such that by May 2007 most of the debris has been removed and the beach was opened to the public again in early May. There is little sign of the mess that appeared on TV and in the press four months ago. 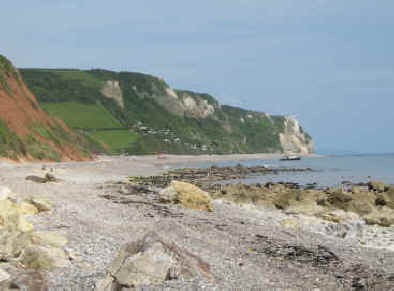 Much of the land around Branscombe is owned by The National Trust and the South West Coast Path runs along here - go east to Beer, around two miles or west to Sidmouth, around four miles. The hike up the cliffs is quiet tough as they rise 450 feet above the beach! You can go along the beach - but check the tides and you need to come up a cliff at some stage. And yes they do sell beer in Beer - so you can sit and admire the view in a beer garden overlooking the beach! 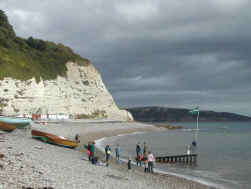 Weston Mouth is about a mile to the west of Branscombe, it is a small pebble beach. There is no road access but a path leads up the cliffs to the tiny village of Weston where there is parking. *All that is left of the stricken Napoli is the huge anchor which was presented to the village by the ships owners and is now on displayed near the cafe. Seaton Tramway - Take a tram trip along this picturesque route.